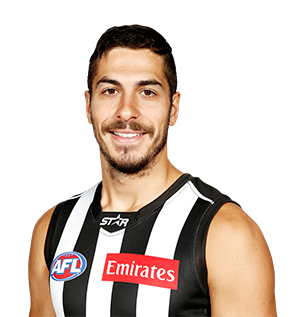 Collingwood's multicultural ambassador Patrick Karnezis has kicked three goals in a strong performance against the Northern Blues at the MCG. Collingwood has finalised its team for Sunday’s clash with the Western Bulldogs. Karnezis is a unique player, for he stands 191cm but has the capacity to play in the midfield as well as go forward where his height stands him in good stead. The 21-year-old was drafted in 2010 as a half forward where he “felt most comfortable” in his junior days as he told The Age. He began his days as a Lion playing predominantly in attack, kicking 17 goals in 11 games in 2011 but sought to move further afield in the past two years. He received limited opportunities in 2012 and again in 2013 despite several impressive performances for the Brisbane reserves. His transfer to Collingwood saw him run into injury trouble, but if fit and firing could provide something of an x-factor to the team's attacking division. 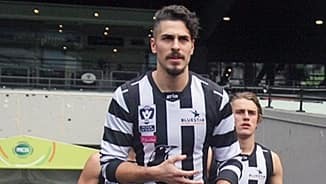 Karnezis endured a topsy-turvy first twelve months at his second club, mixing some promising displays in the VFL with several weeks on the sidelines. Groin problems restricted his progress during the pre-season, denying him the opportunity to build his fitness base and press his claims for a senior berth during the NAB Challenge. He made his first appearance as a Magpie in the third round of the VFL season against Coburg, and he wasted no time in making an immediate impression, kicking three goals from five kicks. Karnezis followed that with a further four goals against Essendon at Windy Hill and another six against Geelong four weeks later, raising the hope of a mid-season senior debut. Sadly, injuries put paid to any hopes of a promotion. Karnezis damaged his hamstring during training in the lead up to round 11, sidelining him until the VFL team’s trip to Morwell in round 12. It didn’t take him long to find his best form, slotting four goals in the loss to the Northern Blues at a windswept Preston City Oval. Further injuries meant he was not sighted again for another three weeks, and while he played out the remainder of the year in the VFL, he was unable to break into the senior outfit. He remained in the match committee’s mind until the final rounds, when he was named as a senior emergency. Karnezis threatened to leave his mark on the VFL side’s Elimination Final against Sandringham, only for inaccuracy to mar an otherwise lively performance in windy conditions at Victoria Park. Karnezis began the year like the proverbial house on fire, averaging 20.2 possessions (the second highest placed Lion) across four of Brisbane’s five NAB Cup games. 15.2 of his touches were uncontested and he ranked third for average rebound 50s (2.5). Collingwood wasn’t spared in his hot start to the year with Karnezis winning 20 possessions, six marks and three inside 50s in Brisbane’s 34-point win over the Magpies in the third round of the competition. 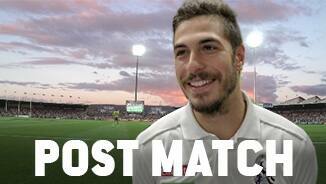 After such a bright start, you would presume that Karnezis would have featured heavily in Brisbane’s home and away campaign. Unfortunately it wasn’t to be, as he managed only three senior games and only one after round two. Coincidentally, that one and only game was against Collingwood in round 10 when he won 18 disposals and five clearances in the Lions’ loss at the Gabba. When playing for Brisbane’s reserves in the NEAFL, Karnezis was a consistent performer, contributing both in the middle and in attack. His season peaked with 41 possessions, 15 marks and six scoring shots against Labrador in round 13. It was one of seven games in which he had more than 30 touches of the Sherrin while he kicked at least one goal in 12 of his 14 games. Karnezis was also strong around the stoppages, winning a season-high 11 clearances against Sydney’s reserves in round 20, a match in which he kicked four goals and three behinds. Karnezis’ consistency was rewarded when he was named on the wing in the NEAFL Northern Conference’s 2013 Team of the Year. A difficult second season for the supremely talented youngster. Played seven games but spent most of his time in the reserves where he played a lot more in the midfield than he did in his first-year small forward role. Showed marked improvements in several areas and has the poise and class that could make him a frontline midfielder in years to come. The athletic Karnezis was a standout in his first season, playing as a third tall forward. Kicked goals with his first two kicks in the AFL against Richmond and never looked back, being named the Lions' best first-year player. Will be a Lion for another two seasons after signing an extension mid-season. Tall forward from the Oakleigh Chargers who can win his own ball. Averaged eight kicks a game and bagged five goals at the 2010 National Under 18 Championships. Has strong hands and sets up scoring opportunities for teammates as well as creating his own. The Lions hope he will be a hard player to match up because he has the goods both overhead and at ground level.